Disney has some innovative approaches to elevate the perception of "Black Panther" in the Oscar race, and they just might work. Ryan Coogler at #AskBlackPanther event. Marvel movies aren’t supposed to crack the Oscar code. They’re comic book movies, after all. Even “Wonder Woman” whiffed its swing at Oscar nominations. But 32-year-old Ryan Coogler took his assignment seriously. He didn’t feel limited by entering the Marvel universe. He felt supported, emboldened, and, with Marvel writer Joe Robert Cole, submitted a sprawling script crammed with ideas that had to be whittled down to a two-hour movie. He didn’t just do what Marvel told him, though. 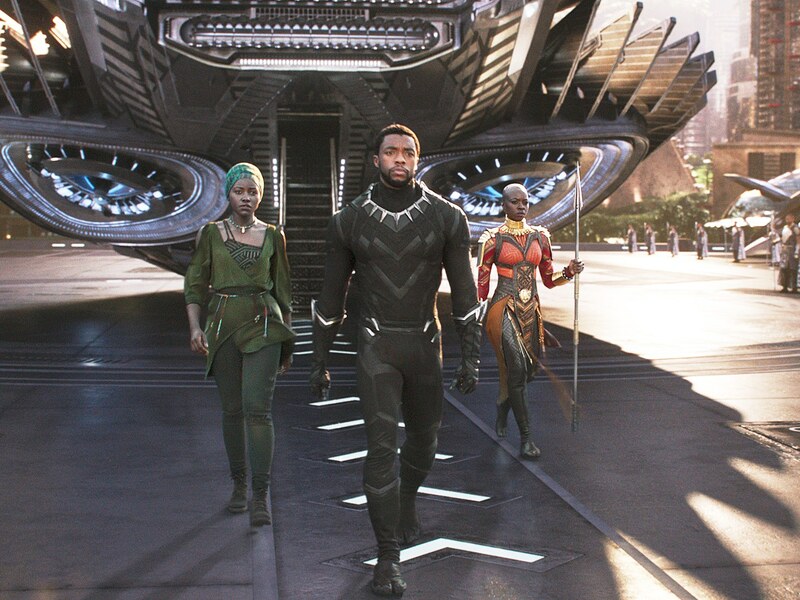 He brought in twice Oscar-nominated costume designer Ruth Carter (“Malcolm X,” “Amistad”) and first-time woman cinematographer nominee Rachel Morrison (“Mudbound”) along with other old collaborators and first-time Marvel hires Hannah Beachler, who wowed Marvel with her production designs for Wakanda, Swedish composer Ludwig Göransson (a collaborator since film school at USC), and editor Michael P. Shavwer. And he crafted a movie that presents superhero T’Challa (Chadwick Boseman), an African king who presides over Wakanda, a hidden, wealthy and technologically superior African kingdom. Supported by a class of warrior women (Angela Bassett, Lupita Nyong’o, Danai Gurira), he is threatened by a wounded, vengeful African-American cousin (Michael B. Jordan as Killmonger) who has deep scars that cannot be healed. White characters are strictly supporting players. The rest is history: “Black Panther” marked the first movie at a $200 million budget with a majority cast of African descent, with a costly marketing machine backing a blockbuster release plan. The movie scored not only an 88 Metascore, but $1.3 billion in worldwide box office. But the movie opened way back on February 16. “Black Panther” is poised to ride the swells of worldwide acclaim to become a truly popular Best Picture Oscar contender as Disney pushes this Marvel superhero success beyond the technical achievements. Disney and Strategy PR started crafting the “Black Panther” Oscar campaign last summer. They knew they would need to bring the movie back into year-end voters’ minds, from critics and the industry guilds to Academy members. It need to be discussed, debated, rediscovered — and elevated. Beyond sending out glossy coffee-table books, they needed the film to be seen by cinephiles (including older Academy members) who were never interested in watching it in the first place. These people assumed the movie wasn’t for them; how could they bring them into theaters to see it? The Oscar strategists played around with showing the film at the Alamo Drafthouse chain around the country, but decided their younger audience had already seen the movie. They wanted to get the arthouse crowd to talk about an entertaining movie with subtle messaging about African-American identity. Then, Strategy PR’s Cynthia Swartz met with the Film Society of Lincoln Center’s deputy director Eugene Hernandez in Toronto to discuss the award season and came upon another artful way to bring “Black Panther” to a new audience. They started planning a Coogler event at Lincoln Center, which they would stream to theaters. And with Film Comment, they saw an opportunity to reach out to the Arthouse Convergence, a group of indie exhibitors. The streamed Coogler Q&A would be a win-win for everyone looking to create momentum with local theater events. Sure enough, 15 theaters signed up for Film Comment’s free #AskBlackPanther event November 27. Disney not only agreed to provide the movie for free on the Giving Tuesday after Thanksgiving, but also made a donation to every participating arthouse and offered to make a DCP available for repeat viewings as well. When they realized Coogler would only be available near his home in the Bay Area, they asked the Mill Valley Film Festival’s San Rafael Center to host the screening and Q&A with Film Comment editor Nicolas Rapold, who got Coogler to talk about how, as a closet film nerd, he used to sneak away from football practice to go to his local arthouse. Four cameras captured not only Rapold and Coogler but also their intimate interaction with the audience. Whether this will have an impact on the Oscar race remains to be seen, as Academy voters are a notoriously snobby lot. If they see it, it could rise in the rankings of Best Picture contenders. At this point, a likely winner is not at all clear. Critics’ faves “Roma” and “The Favourite” both boast passionate fans along with many detractors, while several contenders, from “Green Book” to “BlackKklansmen” have something tainting their smooth progress to Best Picture. Current frontrunner “A Star Is Born” is teetering toward blockbuster status that won’t hurt Bradley Cooper and Lady Gaga’s chances, but could hurt its perception of gravitas. The question is open as to which film best represents the way Hollywood wants to show itself to the world. “Black Panther” could turn out to be the movie that has all right attributes. The Directors Guild and the Academy could both recognize that Coogler deserves recognition. It’s the best-reviewed Marvel movie ever, will notch a sizable number of craft nominations, has historic significance, and qualifies as a huge popular film at just the right time.